Michael J. Fox has a firm grasp of the hardships of life, but in spite of (or as he says because of) these hardships, he is one of the brightest and most positive influences in the world today. 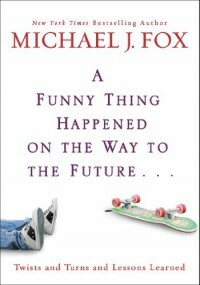 Passionate, funny and inspiring, "A Funny Thing Happened on the Way to the Future" is an absolute must read not only for recent college grads. It's for anyone who is feeling a little down about life's prospects or who just wants a little encouragement in today's stressful and often scary world. It takes only a few hours to read it cover to cover, but it's also broken up by parts and then further by "chapters" that can be read as mini exhortations in only a few minutes. "A Funny Thing Happened on the Way to the Future" is a surprising realistic and yet wonderfully inspiring and funny motivational "memoir".